The Ward Lake trail is located in the Grand Mesa National Forest near Grand Junction, Colorado. 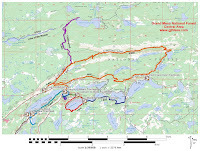 The marked trail runs between the inlet and the dam along the south side of the lake. By incorporating a connector trail and the road through the campground a loop can be completed for an easy hike. Easy is of course relative. The elevation is over 10,000 feet which by itself may be a problem for some. We begin by following the dirt road along the north side of the lake. After a short distance take the right fork that gradually climbs around the hillside above the lake. 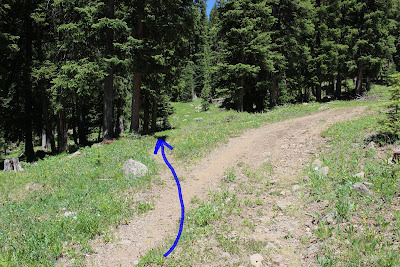 Watch for a faint trail that departs on the left that heads toward the campground. Follow the access road through the campground to continue on around the lake. There are several more restrooms in the campground the newest of which is toward the west end. As you might expect at this elevation wildflowers are plentiful with a large variety including these owl's claw aka orange sneezeweed that are being enjoyed by a common leopard butterfly. There are also columbines, dusky beardtongue, skypilots, larkspur, marsh marigolds, raspberries, elkweed, sierra fumewort, parsley, balsomroot and Indian paintbrush to name a few more. The trail leaves the road and crosses the dam to the south side of the lake. Even though it has a dam Ward is a natural lake. You might say that it has been enhanced to hold a little more water and has an irrigation gate to control the outflow. 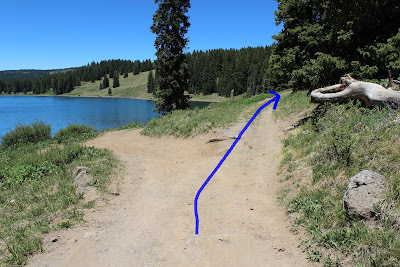 The trail around the south side of the lake is a little rocky but it is very pleasant to hike. That's why we saved it for the last part of the loop. There are plenty of nice fishing spots all around Ward Lake. From past experience I can say that the fish seem to really like Power Bait although salmon eggs don't do too bad either. The trail passes below some private cabins near the east end of the lake. For those interested there are also rental cabins at Spruce Lodge, Grand Mesa Lodge near Island Lake and Mesa Lakes Lodge on the north side of the mountain as well as numerous Forest Service campgrounds and a few primitive areas where camping is allowed. We didn't require any mosquito spray on this outing. The mosquitoes generally die out a lot quicker on the south side of the Grand Mesa than they do in other places. 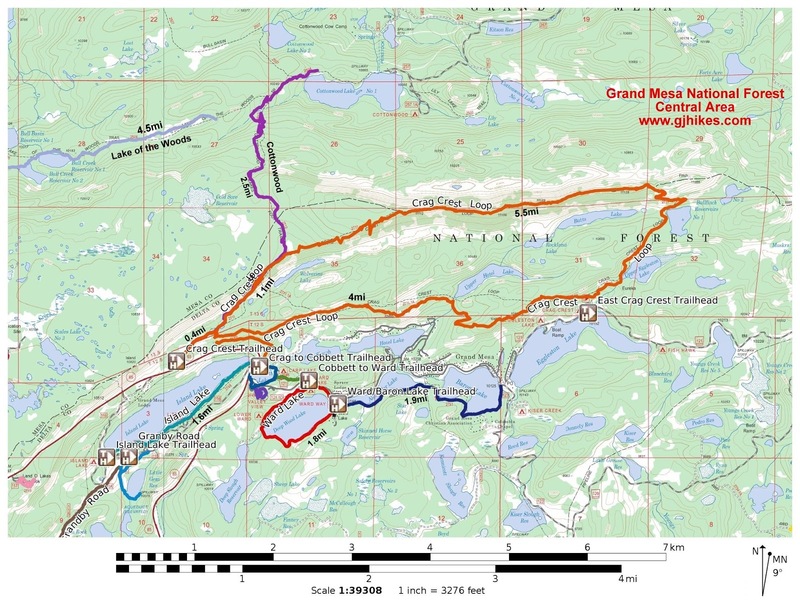 The Ward Lake trail is ideally suited for anyone staying in the area but it serves equally well for those that have come up for the day to have a picnic, go fishing or just spend some time on the Grand Mesa where the temperatures are much more enjoyable in the summer than the lower elevations. If you would like to see it for yourself then all you have to do is 'Take a hike'.